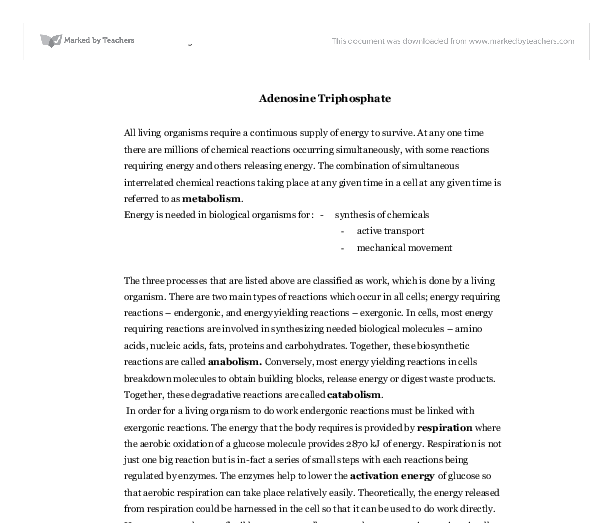 Adenosine Triphosphate All living organisms require a continuous supply of energy to survive. At any one time there are millions of chemical reactions occurring simultaneously, with some reactions requiring energy and others releasing energy. The combination of simultaneous interrelated chemical reactions taking place at any given time in a cell at any given time is referred to as metabolism. Energy is needed in biological organisms for: - synthesis of chemicals - active transport - mechanical movement The three processes that are listed above are classified as work, which is done by a living organism. 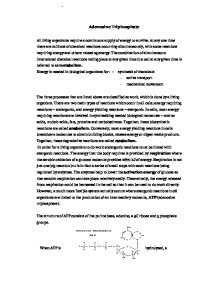 There are two main types of reactions which occur in all cells; energy requiring reactions - endergonic, and energy yielding reactions - exergonic. In cells, most energy requiring reactions are involved in synthesizing needed biological molecules - amino acids, nucleic acids, fats, proteins and carbohydrates. Together, these biosynthetic reactions are called anabolism. ...read more. However, a much more flexible system actually occurs where exergonic reactions in all organisms are linked to the production of an intermediary molecule, ATP (adenosine triphosphate). The structure of ATP consists of the purine base, adenine, a 5C ribose and 3 phosphate groups. When ATP is hydrolysed, a phosphate Pi is lost and ADP is formed. This reaction releases 30.5 kJ of energy and is reversible, it is the interconversion of ATP and ADP that is all important in providing energy for the cell. ATP + H2O ? ADP + H3PO4 ( 30.5 kJ ATP is an instant source of energy within the cell, it is mobile and transports chemical potential energy to endergonic reactions anywhere in the cell. When energy is needed it is simply a matter of hydrolysing the ATP. ...read more. The hydrogen ions are actively transported through the inner membrane/thylakoid membrane into the inter-membranal space/stroma. It is then allowed to flow down the gradient into the organelle via carrier proteins in the organelle membrane. Part of this protein acts as an enzyme which synthesises ATP and is called ATP synthase. The transfer of three H+ ions through the protein channel with ADP and Pi in the organelle allows ATP to be produced. Active transport is crucial to cells in order to maintain the ionic content of cells which directly affects the metabolism of the cell. All cells show differences in concentrations of ions, especially sodium and potassium, with respect to the cell's surroundings. Most cells have sodium and potassium pumps to regulate ion concentration, this requires energy as carrier proteins are moving ions against the concentration gradient. The energy which maintains operation of these proteins is provided by ATP. Sean Fang ...read more. between the two means in trend A is not by chance alone. So for this trend I will now have to reject the alternative hypotheses and accept the null hypotheses. For trend B the critical value for 5% significance is also 2.021, the value obtained by the t-test is 13.5, and this is significantly greater than the critical value. How ATP is produced in both the chloroplast and mitochondria. Method: I will begin by labelling four beakers; one I will label 'Control', one '50% Pectinase', one '75% Pectinase' and the last '100% Pectinase'. Then I will set the water bath at a temperature of 40?C by using a thermometer. A lab coat is also a very good way of protecting a person clothes. Gloves and goggles should be worn while handling chemicals. All the chemicals used in this experiment are quite dangerous unless used in a suitable and sensible manner. Investigating how prolonged exposure to its optimum temperature affects the respiration of yeast. 100 cm� Measuring Cylinder 2 To be inverted and filled with water, so that the Carbon Dioxide released through respiration can float up the water, and cause some space at the top, meaning that the amount of Carbon Dioxide can be measured in cm�. the walls through the basic structure to the arteries apart from the veins walls are much thinner and the lumen which is a passage in the centre that carries the blood however this may vary in size, the largest being is the vena cava (from the body into the heart and the pulmonary vain (from the lungs to the heart).